My parents worked at the Vancouver WA shipyards in WWII where some of the Liberty ships were manufactured. Is there a way to know where these ships "served?" I have a photo of one with #403 written on the photo. 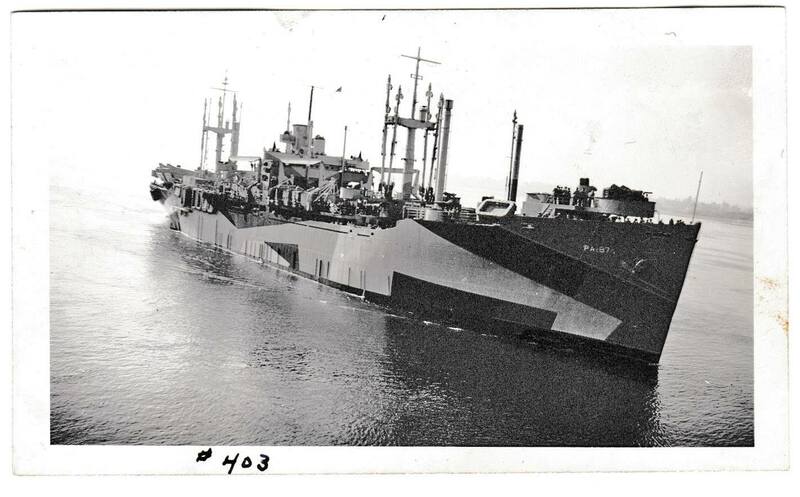 We searched the National Archives Catalog and located 16 file units and 6 items regarding Liberty Ships and Vancouver plus numerous series, file units & items about Liberty Ships in general. Please look them over and contact the specific unit listed for access to the records. We also located a series titled Shipyard Facilities Files, 1941 - 1945 in the Records of the U.S. Maritime Commission, 1917 - 1950 (Record Group 178) that include files on the Kaiser Company in Vancouver. For access to these records, please contact the National Archives at College Park - Textual Reference (RDT2) via email at archives2reference@nara.gov. We were unable to locate specific information pertaining to a Liberty Ship with the hull number 403 or PA-187. Thanks. Would the Seattle Archives have the same information? None of the records cited to you in my previous response are physically located at the National Archives in Seattle. The ship in the photograph is USS Oconto (APA-187). The Wikipedia entry can be seen here: https://en.wikipedia.org/wiki/USS_Oconto_(APA-187) . APA is the Navy hull designation for an attack transport. In the photo you can see the large number of landing craft lined on the ship's main deck as well as the forest of booms surrounding the cargo masts that would be used to load the landing craft with supplies. The Oconto carried troops in various compartments around the ship, landed them during amphibious assaults using her landing craft, and sustained those troops with the supplies she carried. The ship arrived in the western Pacific in late 1944 and took part in operations around the Philippines and Okinawa in early 1945. Her naval career was busy but brief--she was decommissioned and struck from the Navy List in June 1946. She remained a part of the National Defense Reserve Fleet, moored as part of the James River division of the Maritime Administration, but she never sailed under her own power again. The Oconto was sold for scrap in 1974. As to the #403 on the bottom of the photo I wouldn't hazard a guess. The Oconto's assigned Maritime Commission hull number according to Wikipedia was #655, so it couldn't be that. Perhaps Kaiser Vancouver, the shipyard that built her, gave Oconto a local hull number. Thanks! This AM I looked at the photo again, enlarged, and saw the -PA 187 and found the same Wikipedia article that you did. I knew that the Vancouver shipyards built more than liberty ships, but obviously, I don't know what one looks like. Thanks again. The Kaiser shipyards in Portland and Vancouver built ships for both the Maritime Commission and the US Navy. NARA in Seattle has histories compiled by the Navy's Supervisor of Shipbuilding offices in Portland, Tacoma, and Seattle. Within these reports are lists of all of the ships built for the Navy by the shipyards in the area. These reports are in Record Group 181 (Records of Naval Districts and Shore Establishments), 13th Naval District, Commandant's Office, 13ND-5: Wartime Unit Histories. For the wartime history of specific vessels, check out the Dictionary of American Naval Fighting Ships from the Naval History and Heritage Command (there's an entry for the Oconto). But this only helps with naval vessels. For more information on Liberty Ships, Walter Jaffee's book The Liberty Ships from A (A.B. Hammond) to Z (Zona Gale) is a good resource. Good luck with your research! https://en.wikipedia.org/wiki/USNS_Private_Joe_P._Martinez_(T-AP-187) . It looks similar to your photo, with the exception of the gun tub on the bow, which could have been removed postwar. Navy hull designations can be a bit arcane, and the AP/APA split is one of them. The first letter "A" in the hull designation stands for "auxiliary", while the second and third letters stand for a specific auxiliary function. So the "P" in hull designator "AP" is personnel, as in a personnel transport. The third letter "A" in "APA" stands for either amphibious or attack, depending upon your source, thus an amphibious attack (or assault) transport. The Navy changed the amphibious hull designator from "A" to "L" in 1969, and some of the World War II APA's survived long enough in service to be relabeled as LPA's. Even though the Oconto and the Private Joe P. Martinez were identical hull types, there was a significant difference in mission between AP's and APA's. AP's were point to point personnel transports that were equipped to land troops in fully equipped ports in a combat theater in what would be termed an administrative landing. APA's, on the other hand, were equipped with landing craft, both Landing Craft Vehicle, Personnel (LCVP) and Landing Craft, Medium (LCM), to land and supply the embarked troops over the beach in an amphibious assault. Thanks! That is so informative, as I just thought the first A was missing for some reason. I love piecing together the past with everyone's help.